On October 2nd a new Bikestation opened at Washington’s Union Station. Mobis Transportation operates Bikestations in several cities throughout the country including five in California, Seattle, and their first east coast Bikestation in Washington. Change out of your ride clothes before heading out on the town. Basic gear and accessories available for purchase. Provided by Bike and Roll Washington DC. Maps and safety related information. The Bikestation is a sleek structure shaped like a bike helmet. In the Washington Post’s Express Night Out blog commuter George Mino was happy to have a secure place to store his bike. While the Washington Bikestation is built and operated by Mobis Transportation, they are not the only game in town. Chicago’s Millennium Park features the McDonald’s Cycle Center. 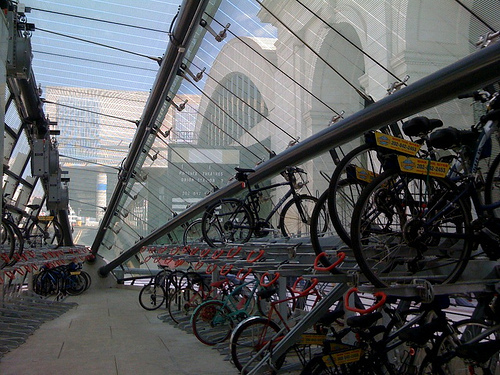 In addition to the amenities featured at the D.C. bikestation, the Chicago station has showers and bike rentals. So, we need one of these here. Where should we put it? I’d say we put them wherever RIPTA plans to put it’s little sub-berths. East Side, by the hospitals, and downtown. We’ll probably only be able to afford one of these bikestations, at least in the sort term. 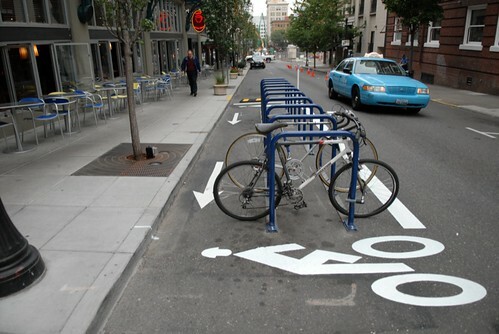 We could see Bike Corrals at the other hubs and other major transit points (ex. Olneyville Square). These bike racks take one or more street parking spaces, preferably at the corner so that the double as a bulb out, to allow for bike parking. New Haven Safe Streets Coalition has a post about the concept. The beauty and quality of Washington’s Bikestation is a grand statement that will legitimize the use and culture of bicycles. It will begin to breakdown the stereotypes of a marginalized transportation mode. 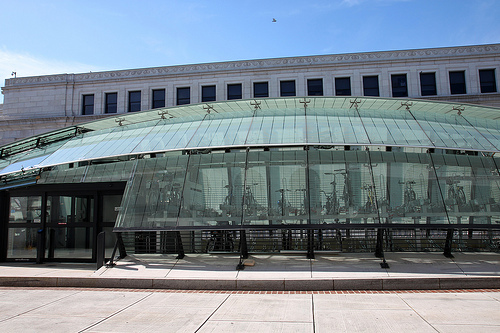 Any info on how much it cost to build the helmet-shaped D.C. Bikestation? I think the only possible choice is right in the heart of downtown where lots and lots of people work. While it’s not perfect, a spot near the train station feeds the Statehouse (as if! ), BCBS, G-tech, the Mall, and Amtrak/T, and it’s close enough to “the three towers” that it works for them, too. Washington DC has almost 700k commute into the city daily. Those numbers probably justify a bicycle center. I lived in DC and between the Metro Red Line and the MARC trains pulling into Union Station there are probably enough people to make it work. The bicycles in the foreground look like they might be rentals, so that might be another way to offset the cost of operating the center. the McDonald’s Center rents and runs bicycle tours from its facility. Have any feasibility studies been done with regards to the size of the workforce in Providence and how many commute or express an interest to commute by bicycle? It would be nice to know if the demand is out there. Could installing and renting out bicycle lockers at the train station or Kennedy Plaza be a good start? If you could utilize the area occupied by the police substation at KP you would have a great spot for some indoor storage without a need for the bulky outdoor lockers. If a desire for showering facilities was needed negotiate with Boston Athletic Club or the health club at the Weston for use of their locker room facility or let them piggy back access to bicycle storage with a membership. The total number of people that work in Providence is roughly 110,000 with about 77,000 (70%) commuting in from outside of the city, according to the Providence Tomorrow Interim Comprehensive Plan from December 2007. Just observation wise (I have no figures) there always seem to be a good number of bikes at the train station. If there were a safe/secure place to store them, I assume there would be more. Jef, you’re right, if there were safe/secure facilities available then people would be more apt to use them. When the MBTA extends to TF Green there would be potentially more bike users to take advantage of a facility. It would also be nice to displace the Amtrak police “parking lot” at the station’s statehouse entrance plaza with an elegant bike parking facility. I think bang for the buck would require it to be between K. Plaza and the train station. How about here next to the river? Have a cafe/restaurant at the river level, then above (which is street level) have the bike station and bike rentals. The gondola landing is right there, there could even be kayak rentals. Interesting idea, the location would be high profile and effective at promoting the facility due to the car traffic at the surface and pedestrian traffic along both the river and the street. A cafÃƒÂ©, especially if it operated 18 to 24 hours, could certainly enliven and make safer the park on ordinary non-event evenings, because of added activity “eyes on the street” (or “embankment” in this case). Would the distance from the train station effect participation by cyclists? It’s likely that the bicycles parked at the station are commuters traveling to Boston to work by train to avoid either paying for parking a car or having to be dropped-off and picked-up. Kennedy Plaza on the other hand seems to operate more as a destination “terminal” coming into the city or a transfer point to go somewhere else. If you lived in Federal Hill or Wayland Square, would you ride and park a bike at Kennedy Plaza to take the #60 to Bristol or Newport? Wouldn’t you just put the bike on the front rack of the bus and take it with you for the other end of the trip? Jef- There was a one time kayak and canoe rentals at the base of waterplace, where the steakhouse is, right out on a dock. This is going back pre-2000. From what I remember it was affordable and I always had a good time going out for a ride on the water. I also seem to remember gross stuff floating around in/on the boats after a heavy storm. I’m sure that’s not the reason it’s no longer there but it may have been a contributing factor. I work with Mobis/Bikestation and wanted to let you know that Providence could definitely benefit from bike transit centers. Bikestation DC is a full-service and staffed facility. 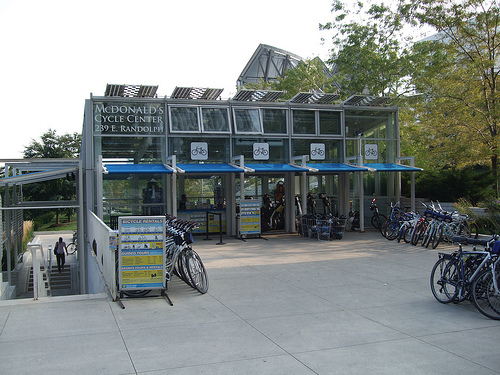 (By the way, Bikestation also consulted on the development of the McDonald’s Cycle Center in Chicago.) Another option that may also work really well for Providence is the new Bikestation bike Module – a cost-effective, compact bike transit center. It’s kind of a Bikestation-in-a-box and can fit in a single car parking space and provide secure indoor bike parking for up to 80 users. We’d love to work with Providence to determine what would work best for your community and where it should be located. We really appreciate all of your feedback and input! Hey Jef.. Great post. I wonder when my neighborhood could afford a bikestation like the ones you have depicted in the pictures! Here we usually park on the pavements.. lol.. And you are bang-on with the fact that the only deterrent to biking in urban areas is a proper place to store/park them. Keep up the good work! I’m not sure I’d call that the only deterrent. The main reason I don’t bike in the city is because I fear for my life with the way people drive around here.